WAIST HIGH: Depeche Mode Now Sharing Tracks From New Album. Depeche Mode Now Sharing Tracks From New Album. Depeche Mode have begun streaming tracks from their new album Remixes 2: 81-11 on their Facebook page. 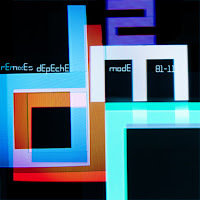 Remixes 2: 81-11, set for release on June 6, will be DM's latest collection of remixed songs going as far back as Speak And Spell (1981) and up to Sounds Of The Universe (2009). The band's last remix collection Remixes 81-04 was released in 2004. From depechemode.com: Depeche Mode have been at the forefront of remix culture for the best part of three decades and this new compilation includes classic mixes from M83, UNKLE, Trentemøller, François Kervorkian and Dan The Automator, alongside all-new mixes from Stargate, Eric Prydz, Karlsson & Winnberg (from Miike Snow) and Röyksopp. In addition to this, the expanded editions include exclusive remixes by former band members Vince Clarke and Alan Wilder - the first time either artist has remixed tracks for their former colleagues. Remixes 2: 81-11 will be available in single and triple disc versions, a 6 x 12" vinyl LP box set, and for download.